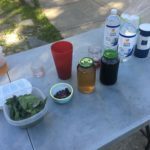 In January, a group of urban orchard folks got together and with the help of the Alliance for Community Trees and the Arbor Day Foundation created the Community Orchard Network. We are now almost 200 strong, people who are involved in, or seeking to be involved in, creating, promoting and managing urban orchard work. We hold monthly webinars (the last Tuesday of every month) on topics such as creating food forests, organic and permaculture pest and disease control, and more. Our goal is to create a greater awareness of this growing movement of perennial farming in urban environments – and spread the word about the nutritional, environmental, social, economic, emotional and spiritual gifts of urban orchards and food forests. If you want to join us, send a request to community-orchard-network@googlegroups.com or Orchard@ACTrees.org.